Bad things happen when I go shopping without a list. It is 3:30pm and I am sitting at my desk at work flipping though my mental recipe cards, trying to come up with a plan for dinner. Despite my best intentions, I have not planned my meals for the week because I spent the weekend testing recipes for the blog to the exclusion of all else. I finally decide on something, but since I am at work I can’t do a quick check of the kitchen to see if I have everything I need. To be safe I end up buying the things I am not sure about only to find that I have a healthy stash of them in my pantry already. This is my sad cycle. I do eventually use up the surplus, but I always feel like a failure. Yes, I have tried to create a structured meal plan, but they make me feel sort of claustrophobic. Trapped. I know I should eat the meals I planned, but in a fit of childishness I rebel against my plans and make something different. It is sick. I was in a ‘clearing out the fridge” mode the other evening when I found I had THREE open packages of bacon, each with one or two strips in them. Who does that? I also had a 12 pack of beer sitting on the floor that did not fit in my beer drawer (not so bad except I kept stubbing my toe on it). I gathered up the bacon, as well as some bits of cheese and half a red bell pepper that were languishing in my refrigerator, cracked open a beer, and set to work. Really, you could use any veggies and cheese you like here just so long as they compliment the beer and bacon that make this bread so very, very good. Speaking of bacon, I realized that I could, and really should, use the drippings rather than melted butter, but feel free to use butter if you prefer. The bacon drippings just felt like the right thing to use. 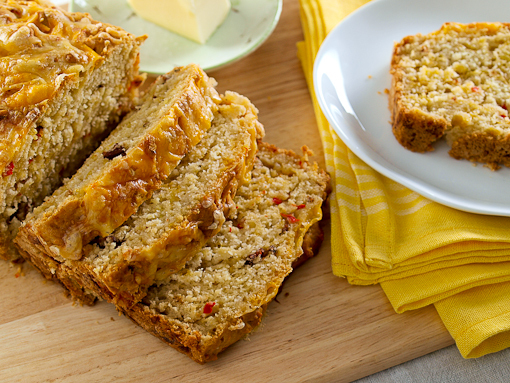 The bread is incredibly tender yet hearty. The cheese, pepper, onion, and bacon make this very savory, so I added a liberal amount of honey to balance the flavors. 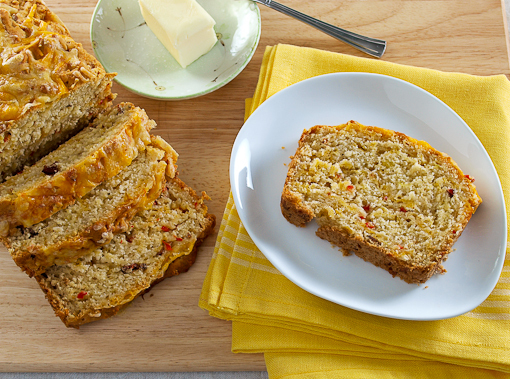 It also helps this bread stay moist for a day or two after baking. This is wonderful warm, or toasted with a little butter. I think this would also make a wonderful base for a stuffing, and trust me when the holidays come around I will be trying that out! 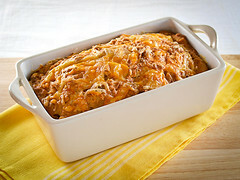 Heat the oven to 350 F and spray a 9x5x3-inch loaf pan with non-stick cooking spray. In a medium skillet over medium heat add the chopped bacon. 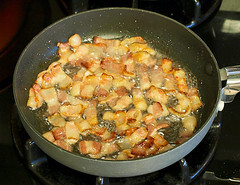 Cook, stirring frequently, until the bacon is crisp and the fat has rendered. 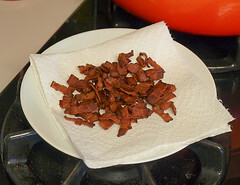 Transfer the crisp bacon to a paper towel lined plate to drain. Drain the fat from the pan leaving 1 teaspoon in the pan. Reserve 1/4 cup of the drained drippings. 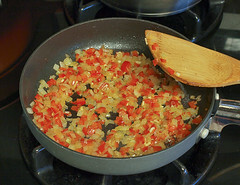 Return the pan to the heat and add the onion and bell pepper. Cook until the onion and pepper are just tender, about 2 minutes. Add the garlic and cook until fragrant, about 30 seconds. Remove the pan from the heat and let the mixture cool to room temperature. 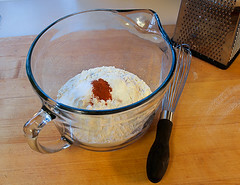 In a large bowl combine the flour, baking powder, baking soda, salt, and cayenne pepper. Whisk to combine. In a separate bowl combine the beer, buttermilk, bacon drippings, and honey and whisk until well combined. Pour the wet ingredients over the dry and mix until just combined, about 10 strokes. 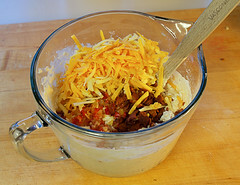 Add the bacon, the onion mixture, and 1/2 cup each of the cheddar and smoked Gouda and fold to mix, about 5 strokes. 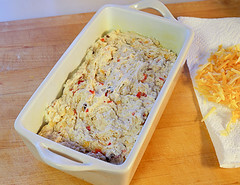 Pour the batter into the prepared loaf pan, making sure to spread the mixture until it is even. 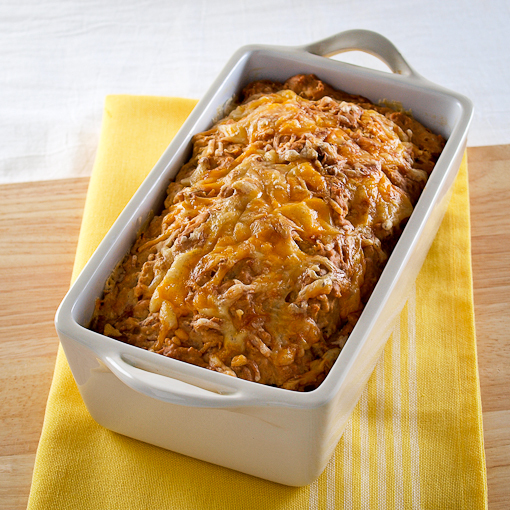 Bake for 30 minutes, then top the bread with the reserved cheese and bake for an additional 25 to 35 minutes, or until the cheese is golden brown and the bread starts to pull away from the sides of the pan. Cool in the pan for 15 minutes then transfer to a wire rack to cool completely. 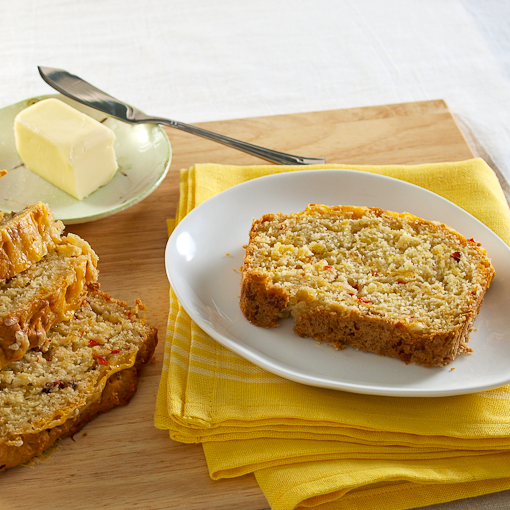 Enjoy warm or at room temperature with or without butter.